The second and final day of the conference began early with breakfast and the business meeting. Janiss Garza, with the help of her therapy cat Summer, presented a talk on adventure cats, and PR guru Lea-ann Germinder wound it up with Story telling methods for your brands. There was a lot of networking, aka chat and conversation. With the conference group a comfortable number, it was a relaxed atmosphere. In the evening, everyone dressed in their best cat clothes, and we were treated to an excellent dinner. Then came the awards ceremony. 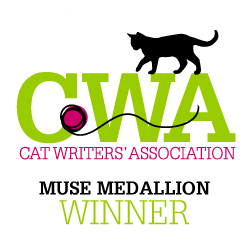 The CWA contest has many categories and many chances to win the coveted Muse Medallions plus the special sponsored prizes. 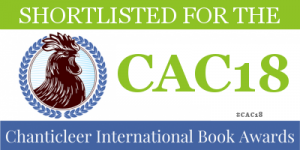 I had entered several things from book to blogs, and some had reached the short list, but the competition was steep and I’d convinced myself the other entries in the categories were so much more worthy than mine. I was surprised, amazed, and humbled to win Muses for short story, poem, and a blogpost. The award for the poem means the most, written with love for my new old boy, Tyler, adopted this time last year. Many other people won Muses for their excellent writing, blogging, artwork, and more. I’d love to name them all but I’m writing this on my phone and it takes forever. So more about this great experience when I get home next week. Deb Barnes, Lea-ann Germinder, “Daddy” Kiril, Amy Shojai in their finery. Meanwhile, I hope you enjoyed my travels, and if you are a cat writer, artist, photographer, blogger, or creative cat advocate, please look into joining the Cat Writers’ Association. I can’t tell you how much CWA has done for me. 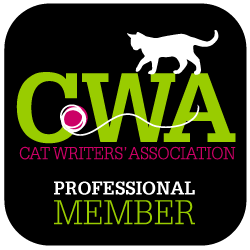 This entry was posted in Blogging, CAT WRITERS, Contests, Crazy Cat Lady Mysteries & More, Writing and tagged Cat, Cat Writers’ Association, CWA 2018, Muse Medallion, writing contest. Bookmark the permalink. Back at you. I thought you should have won in the illustration category, but the winner did have very compelling artwork. I just prefer yours. I met Patty Fry at the conference and we enjoyed talking to each other. Thank you. It was a surprise. Congratulations on the Muse Medallions! Very cool! Cat people are the best! Thank you, Amy. I was truly surprised. With so many great folks there, I can only imagine what fun it would have been, but I can guess there must have been only one real topic of conversation, besides those wonderful medallions that is. But why talk about anything else? OMFP (oh my furry paws)! Miss Mollie that is the best news! Those medallions look furr-tabulous on you! Woot Woot! (blowing kisses to you) You are so-o worthy! Mew Mew, luvs and purrs! Valentine, you make me blush!